Gwendolyn, aged twelve, lives in a city which is concrete and steel, glass and gray. Most of her world is gray, except her red hair. So her marvelous imagination is her refuge, conjuring up leafy, wild worlds for her to run and play in... but this doesn't go down well on the bullet train, or in school. Young adults who find life can be boring and closed in, will enjoy THE MARVELOUS ADVENTURES OF GWENDOLYN GRAY, as our heroine, trying to be good, somehow causes trouble. The Lambents are devices for teaching. Pupils stare into the Lambent and get taught what they need to know. But Gwen doesn't like the bright light, which gives her headaches, so she just reads and draws. She starts to notice suspicious happenings. Kids who use the Lambents forget things that occurred that day. They forget a girl who was taken out of class. Pity the bullies never forget to pick on Gwen. And they don't believe what she tells them. Trying to escape, Gwen takes a long train ride, right to the edge of the automated factories, to the border of the City. Nobody goes here. Whatever she finds, it's bound to get her into more trouble. The ensuing escapades are like The Matrix crossed with Stardust as some wondrous inventions are all that save Gwen and two inventive kids, Sparrow and Starling, from faceless gray men. One thing for sure, your vocabulary will increase while reading this steampunky book. Gwen travels in a bathysphere and boards a pirate airship called Lucrative Endeavour, expanding the locations and characters, while fleeing a horror. This is an exciting read with great variation. B.A. Williamson is a father and a teacher, and is a recipient of the Eli Lilly Teacher Creativity Fellowship. He has imagined the kind of school he really doesn't like and turned events around to a way he does like. His story is full of movement and choices, rigidity contrasted with change. Trust in the power of imagination and the future it will bring. 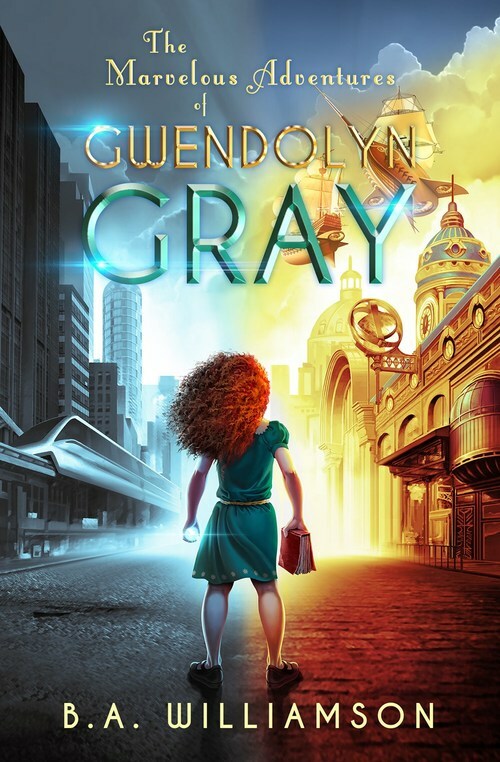 THE MARVELOUS ADVENTURES OF GWENDOLYN GRAY is suitable for YA readers from ten to teenage. I think it's just right for reading under the covers.